The Joseph W. Fridrich Coal and Feed store, circa 1890, the earliest known photo of our store. Fridrich’s is practically an institution in Cleveland. We started out as a coal and feed store back in 1883, and moved across the street to our current location, here in Ohio City, in the 1890’s. 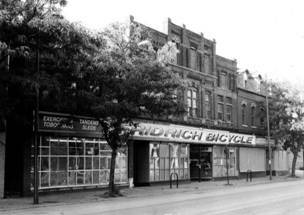 Since then, we have expanded to become one of the oldest and largest bike shops in the U.S.A.! Our goal is to provide superior customer service, whether you are looking for a new bike, need a simple repair, or just want to buy an inner tube. We pride ourselves on having the largest selection of bicycles and parts in northeast Ohio, and our 10,000+ square feet of retail space (and triple that in storage and work areas) makes that possible. We are much more than just a store that sells bikes! We carry tricycles, and other kids' items. We offer bike rentals and delivery on new bike purchases. In the winter months, we sell snow goods: plastic and foam sleds, saucers, Flexible Flyer wooden sleds, toboggans, and much more! We're proud to be a local, successful, family-owned business here in Cleveland, still operated by the grandson of the man that started it over 136 years ago. Stop by some time to check out our store; we’d be glad to show you around!! The above hours show our late winter hours: closed on Wednesdays but open on Sundays. Our hours will expand more as we move into warmer weather. Note that we are hiring for several positions as we move into warmer weather: a cashier and a salesperson. Stop by the store for an application! Unless otherwise noted, all site content ©2019 Fridrich Bicycle, Inc.
Fridrich Bicycles. Please note that we will be closed on Easter Sunday. The front of the store in 1955. At the time the trolley cars were still running and newer electric buses shared the tracks with them. A recent photo of our store.